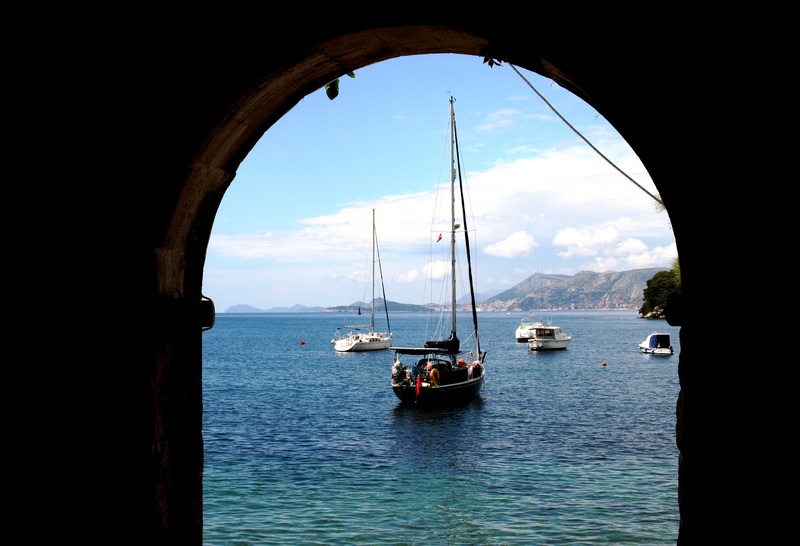 Welcome to a multi-post visual and literary description of our recent trip to Croatia. The purpose of these posts is to reveal the beauty of this country (limited to the areas that we visited) and to share some general information about the geography, people and culture. Croatia used to be a part of Yugoslavia, but became its own nation (one of seven) after Yugoslavia split into ethnic regions. 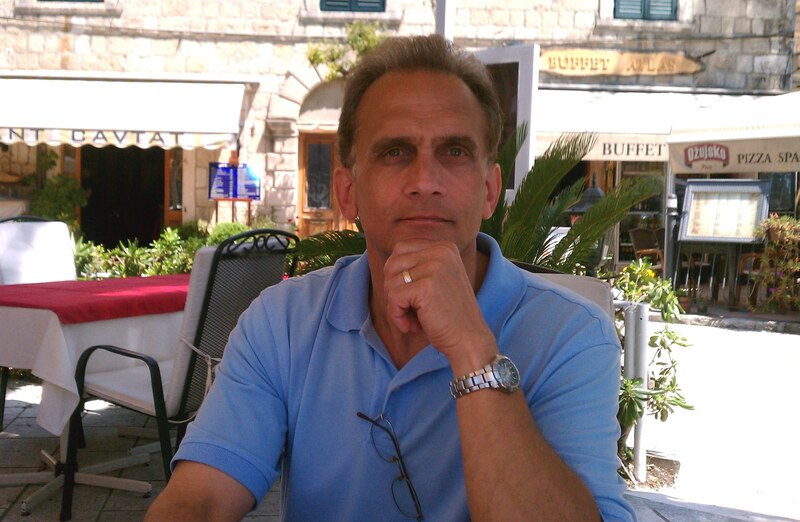 Although this Balkan area of Eastern Europe has been a land familiar with ethnic conflict for centuries, the Croatian people are all about moving forward with a purpose of peace and progress. The photographs presented in these posts were taken by my wife, Cheryl, and myself…we snapped away throughout our journey. Thank you for joining us! Our trip to Croatia began with a missed connecting flight from Frankfurt to Split. We detoured to Dubrovnik, which we were to visit later in the week, and had a five-hour layover before heading to Split. Although exhausted, this proved to be a blessing as we were personally escorted by a gracious taxi driver to a small seaside town near the airport for dinner. Cavtat (pronounced Savtaut) proved to be one of the highlights of our vacation and garnered a second visit when we returned to Dubrovnik as planned. 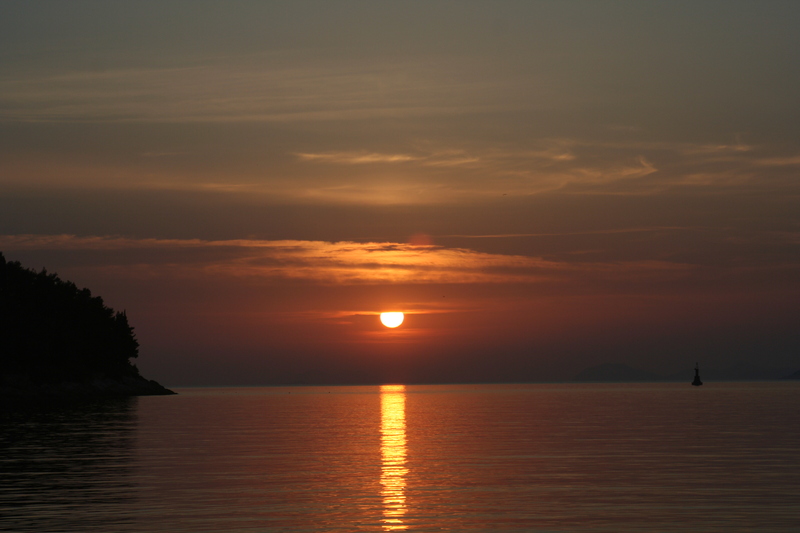 That evening, we witnessed a beautiful sunset over the calm Adriatic Sea while dining at a wonderful seaside cafe. Upon our return to this enchanting city, we began to explore and enjoy the history, beauty and people. We found Croatians to be friendly, hard-working, fashionable and confident people. Also, we were impressed that all spoke English which gave us more opportunities to easily interact with them. 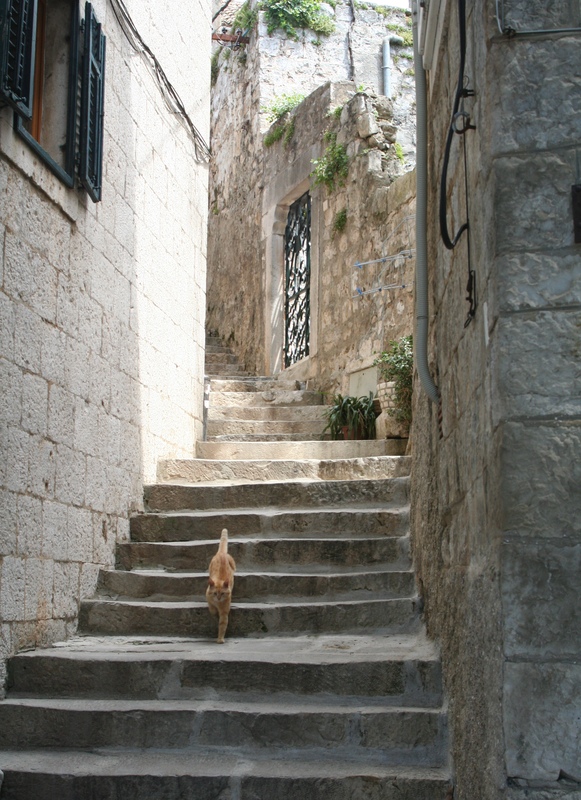 With an abundance of steep paths traversing buildings, we occasionally encountered a cat or dog-none of which bothered us. 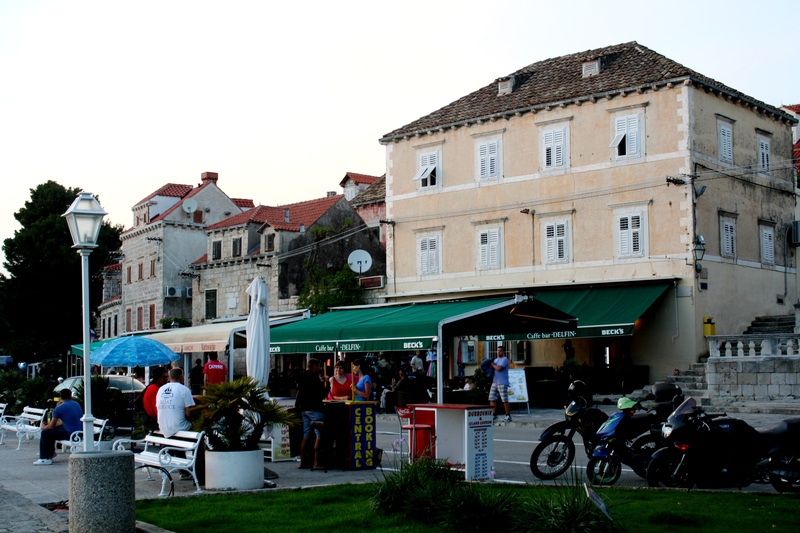 Cafes are abundant in every town, and Cavtat was no exception. 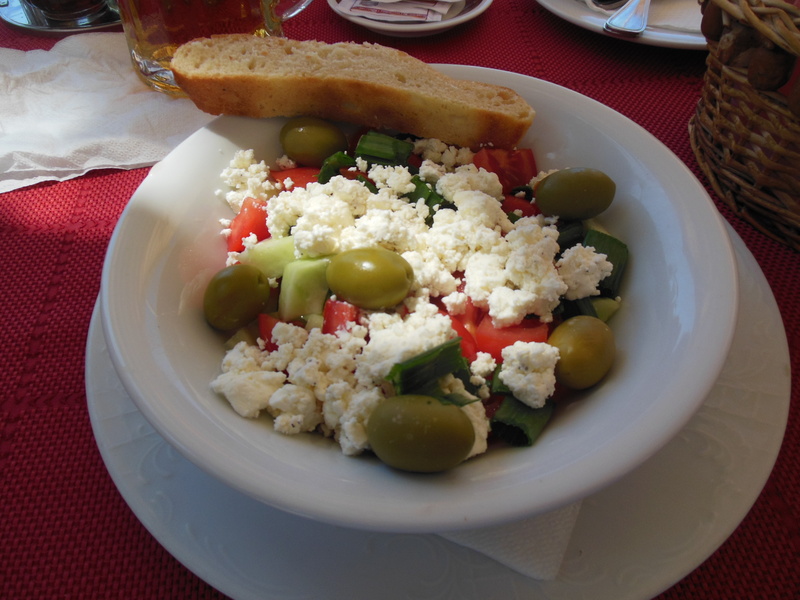 The local cuisine is terrific, with sea food reigning supreme throughout the coastal towns. Octopus seemed to be a regular menu item ! Italian dishes are common as the Venetians controlled this area for centuries before Napoleon’s reign over Europe. Prices are reasonable and the food fresh and of high quality. The service is exceptional. Also, the country has made a concerted effort to keep the cuisine uniquely native. We did not see one American fast food restaurant in the areas we visited. However, we did see some unique food signage along the way, such as Fast & Slow Food cafes! Croatia advertises her own beer in many places. 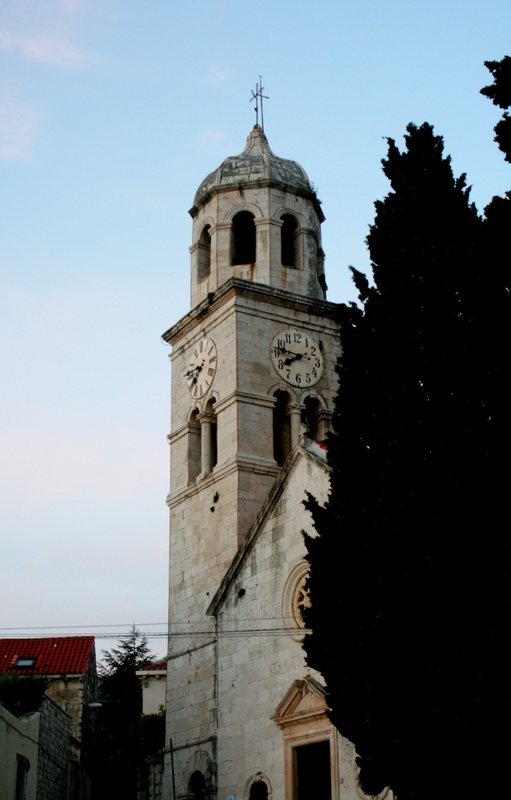 Church steeples dot the landscape throughout Croatia, as do prominent cemeteries. 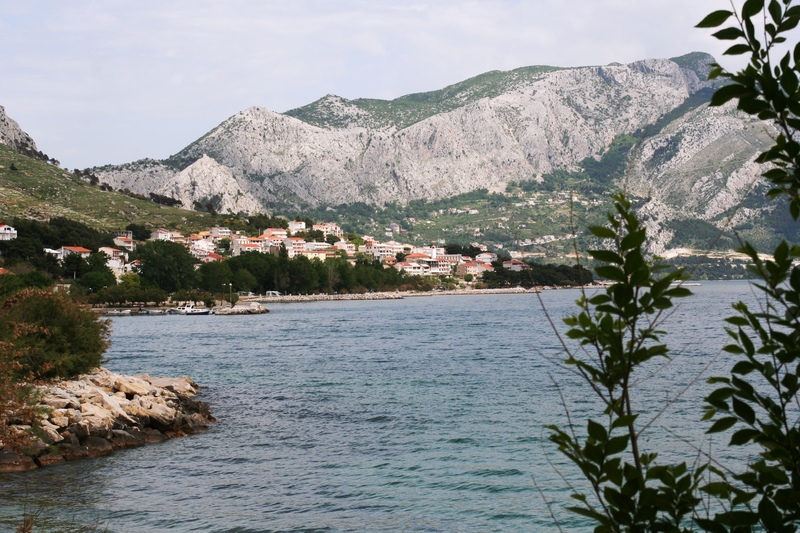 Mountains flank the sea and provide a vivid backdrop to the azure Adriatic. A wide range of architecture has been generous to this region due to the variety of conquering peoples over an extended period of time. 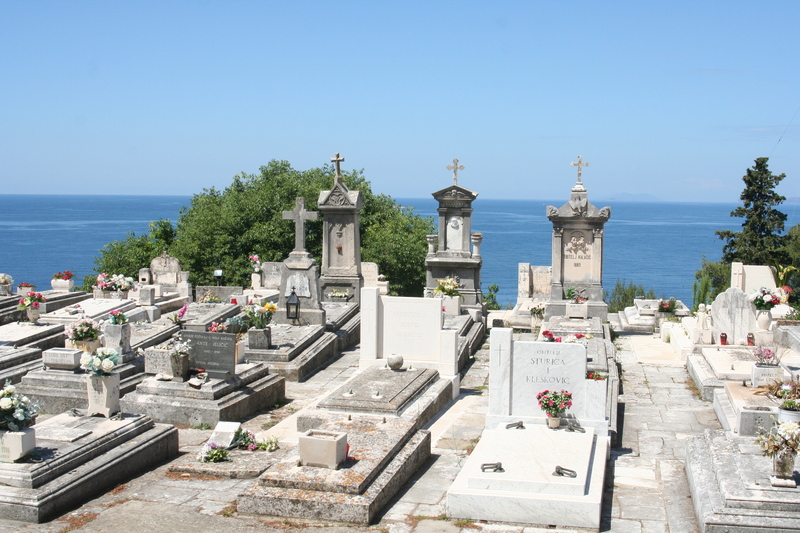 Most older towns have multiple churches, narrow streets between buildings, a multitude of stairs and steep paths, and breath taking views of the sea and mountains. The red-tiled roofs are as common as our shingled roofs, and provided a vivid reminder that we were not in Kansas! As we strolled through the shops, enjoyed a light lunch, and walked along the paths adjoining the sea and up the mountains, we were overwhelmed with a deep appreciation for this experience. Not only was the scenery beautiful, but the climate was moderate with temps in the 70s and low humidity. 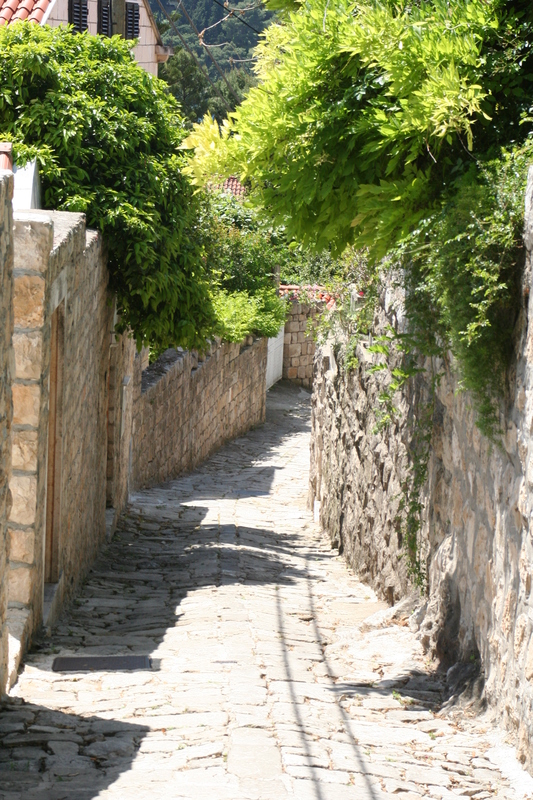 Cavtat is truly a gem among many gems along the coast of Croatia.